Students can practice number identification and counting skills while learning about symbols from the state of Arkansas! 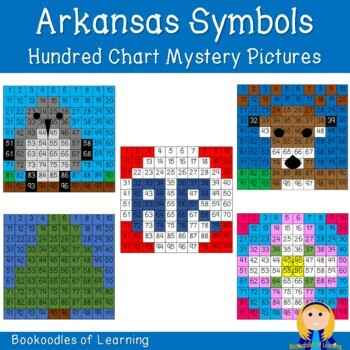 Each of these five hundred chart mystery pictures reveals an Arkansas related symbol (see list of pictures below). 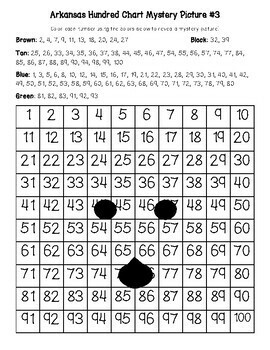 There are two activity options for each picture for differentiation: a completed number chart for coloring only and a blank chart for students to write in the numbers themselves before coloring. 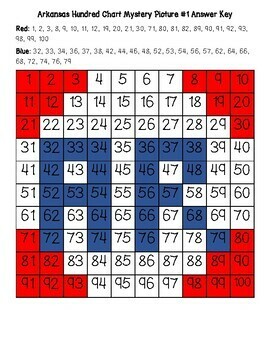 The answer key reveals the colored picture. Optional number cards are included for students who need an easier way to see and keep track of the numbers they are to color with each picture. 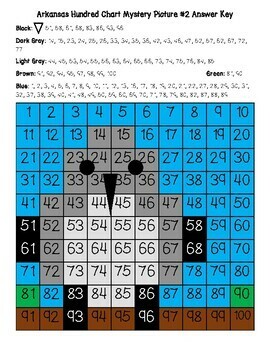 These can be printed on colored paper and given to students who need extra support, or used as a game in which students pick a card and find the number on the chart. Great for math centers as well as morning work or early finisher activities! This can also make a great learning resource for family vacations to Arkansas or home schooling field trips!